O Waheguru! thaerae kavan kavan gun - kavan kavan means which, gun means praises, which of Your praises kehi kehi gavan - should I sing? Thoo saahib gunee nidhaanaa - You are my Lord, You are the treasure of all gunee - of all virtues, of all goodness. How can I sing Your praises O Waheguru? I cannot baran - I cannot describe - n saako means not be able to, baran means to describe; I cannot describe Your mehimaa - Your praises, Your glory O Waheguru. Why? Because You are the Lord and Master, ooch bhagavaanaa - the highest of high Lord and master. Guru jee says, mai har har naam dhar soee - the Name of Hari is my support, soee means my only. My only support is Your name O Waheguru. As it pleases you O God, O Waheguru, thio raakh maere saahib - in that way save me O my saahib - O my Lord and Master. Mai thuj bin avar n koee - without You I have no one else. Rehaao - Gurujee says pause and think about this. I am thaan dheebaan - I take my strength from You Waheguru, You are my thaan - You are my strength, what does that mean? What it means is that You are my truth maere suaamee - O my Lord. For me You are my strength, for me You are the one who I have to answer to, You are my beloved maerae suaamee. Mai thudh aagai aradhaas - I stand and do an ardhaas O Waheguru. Only in front of You do I do my ardaas - for me You are everything. I have no other thaao - no other place jis pehi karo baenanthee - where I can karo - means to do, baenanthee means prayer, it is sort of a supplication, prayer where you are falling on your knees. Gurujee says there is nowhere else to fall, because if we fall at the feet of others all we get is pain, but if we fall at Your feet we get happiness, joy and bliss. Maeraa dhukh sukh thujh hee paas - I tell my pains, happiness only to You. Gurujee says, within this earth vichae paanee - there is water under this earth which we could get to through wells and through other ways. Gurujee says, within the kaasatt - within the wood there is agan - there is fire. What is Gurujee trying to say? Within you is Waheguru. As fire is locked in the wood, it just needs one external flame to ignitie it. So you just need the flame of Guru to ignite Waheguru within you. O saints, Deaekhahu - behold the vaddiaaee - the greatness of Hari, of Waheguru. 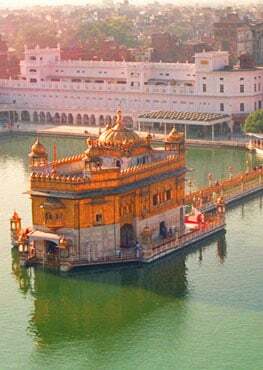 Har Nimaaniaa maan dhaevaaeae - Waheguru gives maan to those who are dishonoured, who are nimaaniaa - who have no honour. He blesses those who are the meek and lowly. Then what happens when those people meditate? As dust from the floor, charan means foot, oopar aavai means to rise. As dust rises when you are walking along on top of your foot and touches your foot, in the same way Gurujee says, thio naanak saadh janaa jagath aan sabh pairee paaeae - those people who have saadh - who have done saadhana of their mind, who have controlled their mind, Gurujee says O Naanak in the same way, to those people who have done the sadhanaa - those people who are imbued in the love of naam, jagath aan sabhh pairee paaeae - the whole world comes and falls at their feet. So what Gurujee is saying in this hukamnama is that keep one support. What is that? Of Waheguru - because that support will never fail you.